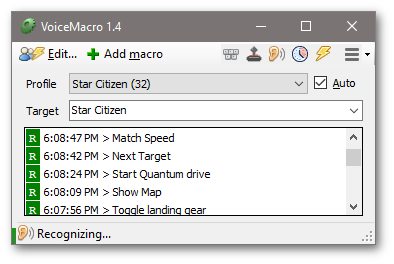 "VoiceMacro is an advanced and efficient software solution created to enhance the way you work on your computer, enabling you to execute certain tasks much quicker than usual..."
"A good solution is VoiceMacro, which can make your computer do mostly anything. The best part is that it can be voice-activated. You can use it in numerous situations..."
"There are more and more options to control your PC using your voice these days. One of the newest is VoiceMacro, an advanced and efficient software tool designed to enhance the way you work..."
60+ fixed internal Variables like for "RepeatCount", "DialogResult", "MacroName" or MouseX/Y and many more you can include in "speak text", as x and y position for mouse etc. VoiceMacro has a clean and small interface, is lightweight and can be used portable. VoiceMacro can be installed on unlimited numbers of PC's for free, however if you use this application regularly and like to see further developments and updates or if you just like to support this project, any donation is greatly appreciated! Although it is possible to missuse VoiceMacro's capabilities, it is NOT intended to be a cheating tool, it does NOT interfere with any Game or Application and is not to be generally considered a "Illegal Third Party Application",- look at it as an additional input method to Keyboard and Mouse like Joysticks, Gamepads, Motion sensors etc. Also bear in mind there are people that are only able to play certain Games thanks to Voice Recognition enabled Macro tools!